Now that warmer weather is finally here (off and on, it’s 37 degrees out right now) we’ve been able to get outside a little to get some chores done. Last weekend we drove up to the storage lot to bring my buddy Lou’s pop-up camper back to our house to do a little work on it before he takes it out camping this week. I’ve been meaning to get out camping again soon, because I’ve been missing the best part of camping out; hiking? campfire? sleeping outside? no, camp cooking of course. I just love cooking and eating outside when we are camping. Some people don’t like it, but I think it’s great, you just need the right equipment. 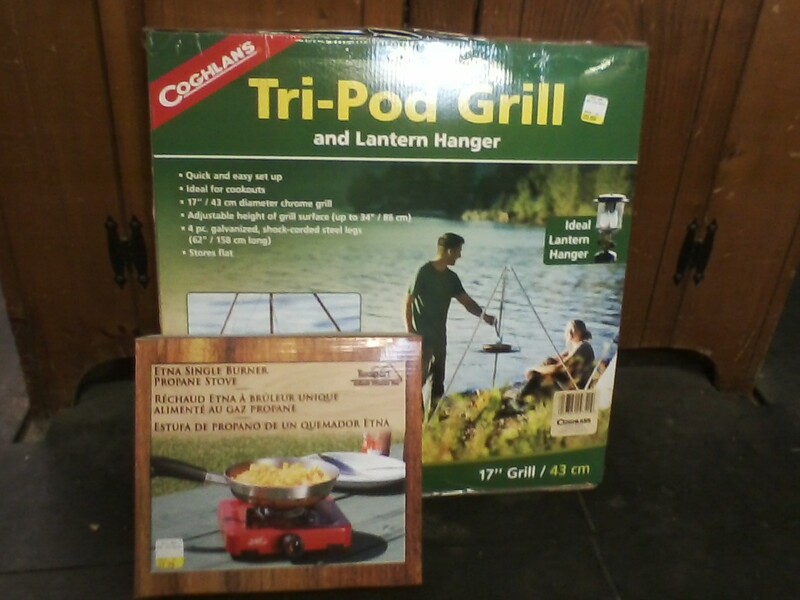 The first thing you need to figure out what you are going to cook on, a camp stove or over a fire. If you’ve got a camp stove, cooking in camp is pretty much like cooking at home (if you’ve got gas at home, and if you don’t, you should). The camp stoves that I’ve used the most are the pump up white gas variety. To use these, you have to fill them with white gas, also known as camp fuel, and then pump up the tank with a little built-in air pump to build up the pressure. Then you just open the valve and light it. They usually work pretty well. A lot of the new ones, though, are made to run on bottled propane, and you turn the knob and light them with a match just like at home (well like our house, where we cook on a classic 1948 magic Chef). Once you’ve got your stove going, cooking is just like at home, the only problems are having only one or two burners to work with, and not having an oven available. 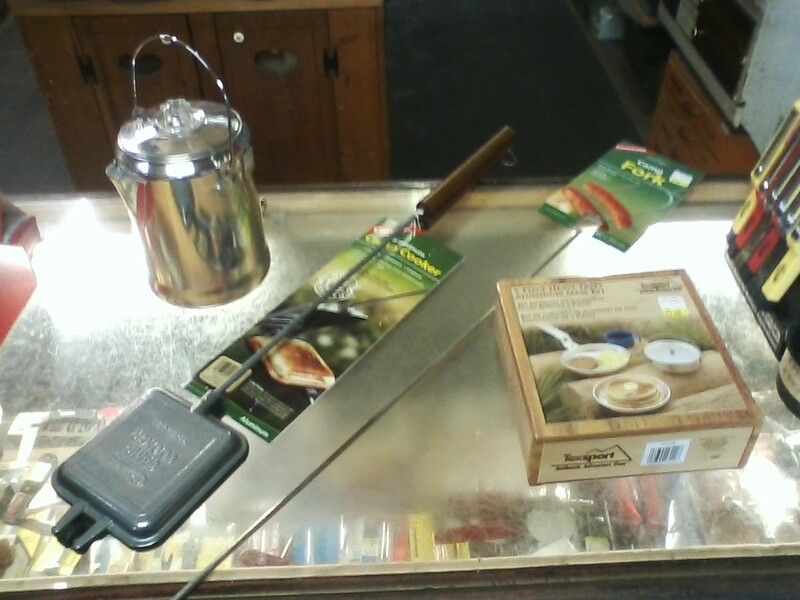 To cook on an open fire takes a little more special equipment. A tripod to suspend your pots from is pretty handy, without one you will have to make do with a grill propped across some strategically placed rocks, or even just the rock themselves. This works, but you have to be careful to avoid spills. 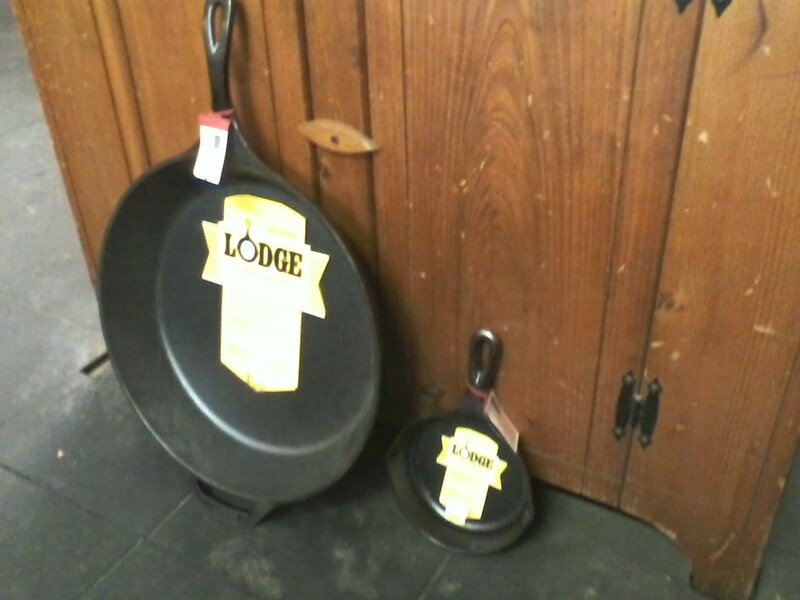 Cast iron skillets are the best for this and they come in all sizes, from the one egg variety to the “feeds the whole cub scout troop” type. Morning coffee can be a challenge to the uninitiated, and don’t even get me started on instant coffee (its only use is to spread around your tent to keep the bears away if you ask me). A good old fashioned percolator will do the trick. You just have to know how to use one. Fill it with cold water, and put ground coffee in the basket. All percolators have their foibles about how much to use, but one teaspoon for each cup, plus one for the pot is the old rule. Put it on the fire or stove, until it starts to perk. Then lower the heat so it doesn’t boil over and let it perk for five minutes. Set it off for a minute or so and pour away. Enough said. Also handy for cooking over the fire are a long roasting fork (or stick for the purists) for hot dogs and marshmallows. Another cool specialty item is a sandwich cooker. This comes in two halves that fold together and you hold it over the fire, although a stove burner will work in a pinch. Butter two slices of bread and put them butter side out into the cooker. Then fill the inside with a filling appropriate for the meal; eggs and precooked bacon for breakfast, ham and cheese for lunch, canned beef stew for dinner, and pie filling for desert. Close and trim off the crusts (give them to the dog) and cook it over the fire until golden brown, viola! The last item to consider taking is a real Dutch oven. 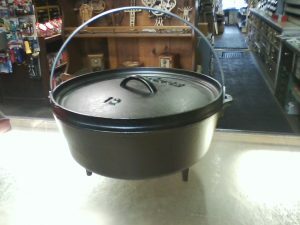 A real outdoor Dutch oven (as opposed to the kitchen variety) has legs to sit on and a lip around the top edge of the lid to facilitate cooking on an open fire. The legs let you rake coals under the bottom to regulate the heat. 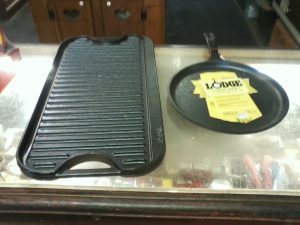 The edge on the lid will hold coals in the same way to heat the top for actual baking. The possibilities are endless, stew, roasts, bread, or anything else that you can fit in there. We are directly across the street from Coffee Corners!